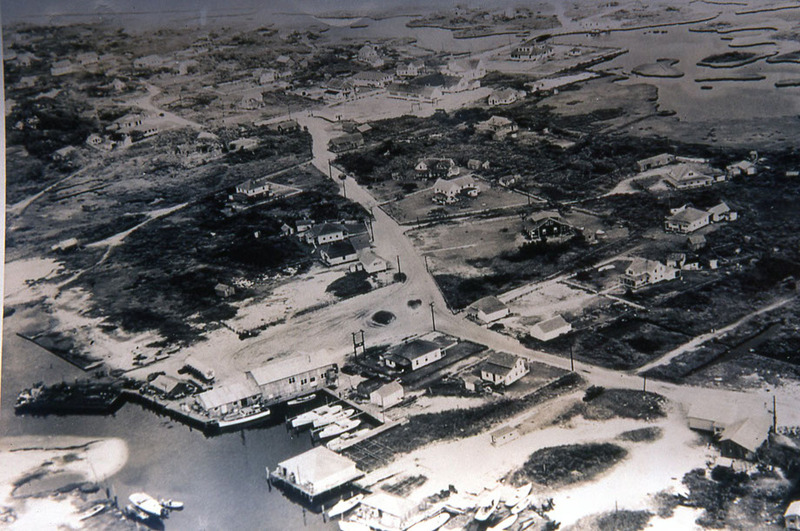 Hatteras Village before paved roads and before there was a bridge. Hatteras harbor (below) when commercial fishing was the dominant form of harvesting from the sea and charter fishing was not yet an industry. 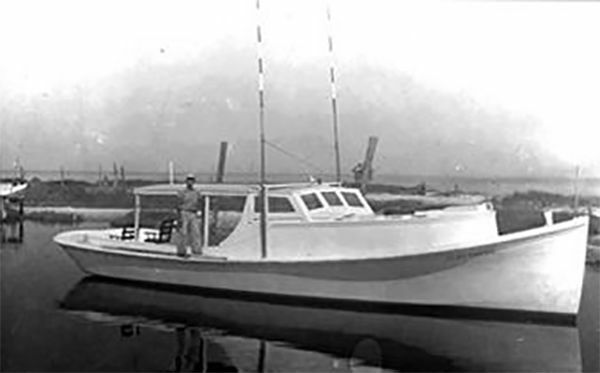 Back in the 1930’s before Hatteras Island had paved roads, before there was a bridge even before most of the island had electricity there was charter fishing. The villagers of Hatteras made their living by commercial fishing. Using cotton gill nets or by use of pound nets (fish traps) they scraped out a difficult living. In the winter time several hunting clubs owned and frequented by off island sportsmen hired the locals as guides and handymen. These sportsmen also occasionally prevailed upon the local fishermen to take them rod and reel fishing, an activity that the locals found to be both strange and amusing. After all, it was a very inefficient way to harvest a meal. 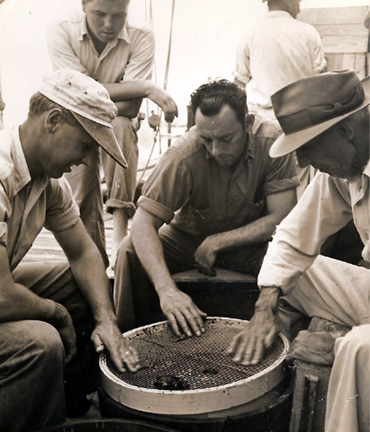 Young Captain Ernal Foster (left) along with his father (right) separating caviar from sturgeon roe. However, one young man saw it a little differently. Capt. Ernal Foster was in his early 20’s and he developed this notion that these wealthy sportsmen would be willing to pay him to take them fishing. His elders in the village told him he was crazy, that it would not work and, like most young men with a dream, he was undeterred. He went to East Lake, NC and purchased the wood needed to build his dream, (Atlantic white cedar or “juniper”), brought it home in the family boat and stacked it in the yard to cure. He then went about the task of trying to find a boat builder who would build the boat he wanted. Finding that builder turned out to be a bit of a task but on the fifth try he found one. He sealed the deal by making it clear that “its my wood and my money and if it does not turn out right it is my problem”. With that understanding Willis and Sons Boatyard in Marshallberg, NC built Capt. Ernal his boat. And how good was their craftsmanship? Launched in 1937 the Albatross is still going strong. The plan was to make charter fishing his first priority. Commercial fishing was to be the secondary part of the financial plan with charter fishing being the primary means of income. That first season, 1937, brought Capt. Ernal 4 charters. And then business boomed! However, World War II brought things to a halt especially considering the fact that the Albatross was forced into military duty by the government (for harbor patrol). After the war ended Capt. Ernal got his boat back and business returned full force. In order to get to Hatteras in those days customers had three choices: (1) take the freight boat from Englhard on the mainland, (2) have Capt. Ernal pick you up there in his boat or (3) take the ferry across Oregon Inlet and drive across sand 48 miles to Hatteras (there was no pavement on the island until 1948). Hatteras did have a hotel, the Atlantic View, and it was close to the Gulf Stream which was very important in the days of 9 to 10 knot boats. At any rate, business boomed. This dramatic increase in business was driven to a great extent by an attempt by Dare County to expand tourism. The County created a Tourist Bureau and hired a talented and enthusiastic director, Aycock Brown. Aycock used the new business of charter fishing as a primary means of promotion. He sent photos out and invited sports writers to visit and it worked —– really well. With the dramatic influx of customers Capt. Ernal found it necessary to talk other commercial fishermen into taking the overflow business. Unfortunately that arrangement occasionally caused problems because if commercial fishing got good there was more money to be had doing that and Capt. Ernal got left holding the bag with very disappointed customers. His solution was to build more boats. His brother, Capt. Bill Foster and his cousin, Capt. 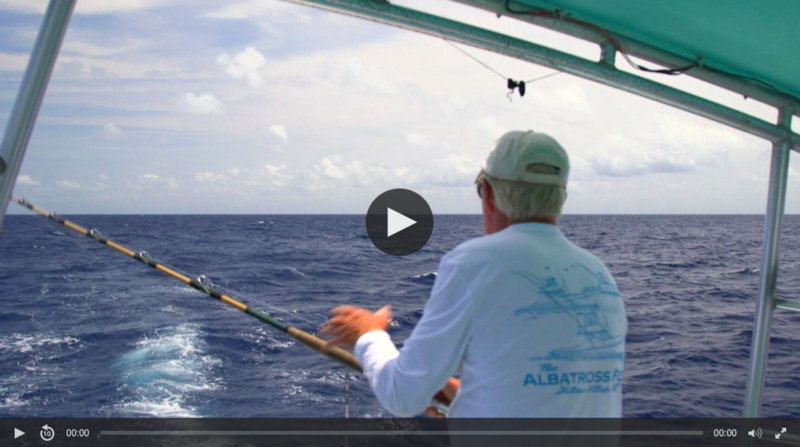 Milton Meekins liked the charter fishing and the Albatross Fleet was created. The Albatross II was launched in the spring of 1948 and the Albatross III followed in 1953.